Sizemore, Burns and Gillmore, LLC was organized in 1945 by Kenneth G. Speir (1908-1987), Vernon A. Stroberg (1914-1990), and Herbert H. Sizemore (1912-1985). The name of the Firm then was Speir, Stroberg and Sizemore and it was originally above the old J.C. Penney building on Main Street. In the 1950′s, the Firm bought the buildings at 809 and 811 N. Main Street, housing the Firm on the bottom floor and leasing apartments in the top floors of 811. 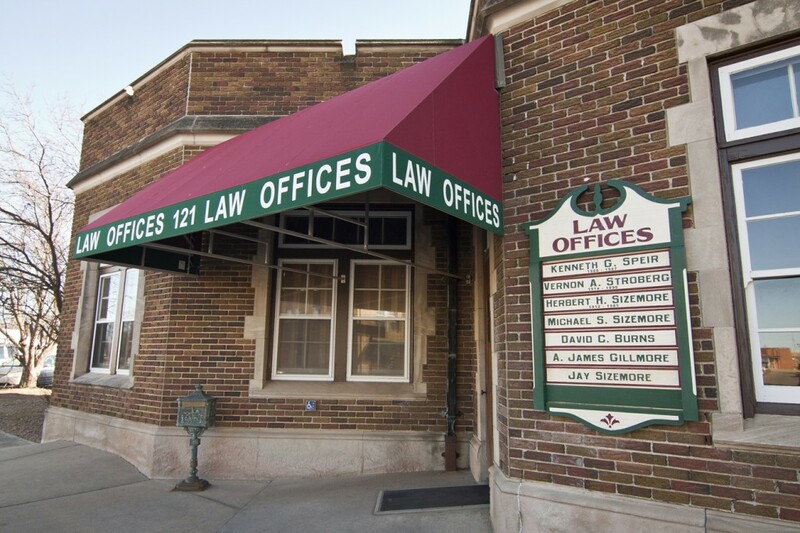 Throughout the years, other attorneys worked for the Firm or rented space from the Firm. Such attorneys include Melvin Gradert, now a retired District Court Judge; John Thomas Reid, who became a Federal Magistrate; and Richard Hrdlicka, who left to assume the role of General Counsel for Hesston Corporation and ultimately for Fiat America in New York City. From 1968 to 1976, the associates Michael S. Sizemore (Herbert’s son), A. James Gillmore and David C. Burns were hired by the Firm. These three associates eventually became Partners and took over the practices of the original three attorneys as they retired. On April 17, 1993, the Firm moved into their new offices at Historic Newton Station and changed the name of the Firm to Sizemore, Burns and Gillmore, P.A. The Historic Newton Station was opened in October of 1930 and was built as part of the Works Projects Administration, President Franklin Roosevelt’s “New Deal” effort to create jobs for all Americans. It once housed the Fred Harvey Lunch Room and Dining Room. The Harvey Girls were housed on the second floor in sleeping rooms. The law firm is located in the area which was once the dining room. The beautiful original Tudor-style wood working remains throughout the building. Amtrak trains still run through Newton on a regular basis and the Amtrak ticket office is still housed in the depot area. The tenants of the building are predominantly professional associations. See our “Harvey House history” page for more information. In 2006 Jay Sizemore (Herbert’s grandson and Mike’s nephew) joined the firm, making him the third generation of Sizemore to be a part of the Firm. Sizemore, Burns and Gillmore, P.A. also maintains satellite offices in the cities of Halstead, Hesston. Dave Burns meets with Halstead clients at the Halstead Bank every Wednesday afternoon. Jim Gillmore sees clients in Hesston on Wednesday afternoons in the MMA office located there.